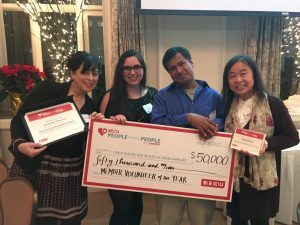 SEATTLE (December 6, 2017) —Last night BECU announced the winners of its 2017 People Helping People Awards, recognizing BECU members and the non-profits they support with their time, talents and donations. At the ceremony, Open Doors for Multicultural Families (ODMF or Open Doors) received BECU’s Member Volunteer of the Year award and was granted $50,000 for its efforts providing support for diverse families with family members who have intellectual or developmental disabilities. This year, more than 230 BECU members nominated their favorite, local non-profits serving the Puget Sound region and beyond. The winning organizations are tackling a broad range of important issues including homelessness, healthcare, education, poverty and hunger. By being recognized as one of BECU’s People Helping People recipients, Open Doors joins a group of 17 other non-profit organizations that support causes BECU members are passionate about. At the ceremony, organizations received awards ranging from $15,000 to $50,000 in five categories: Member Volunteer of the Year, People’s Choice, Employee’s Choice, Past People Helping People Recipient’s Choice and Community Benefit.